Motorola XOOM WiFi Prices Slashed Everywhere, Time to Expect Something New? It’s been a rocky road for the Motorola XOOM, the world’s first ever Honeycomb tablet. A device that was the talk of the tech world back in January has almost been forgotten about as rumored sales numbers have not even come close to expectations. With customers knowing that newer, thinner, and generally better tablets were just around the corner at cheaper prices, the XOOM almost didn’t stand a chance. And well, we’re seeing that this week as prices on the WiFi model have dropped $100 (to $499) across the country to make it more competitive with the Galaxy Tab 10.1s and Transformers of the world. So what’s next in the tablet world from Motorola? First off, they need to fix the 4G LTE situation with the Verizon XOOM. 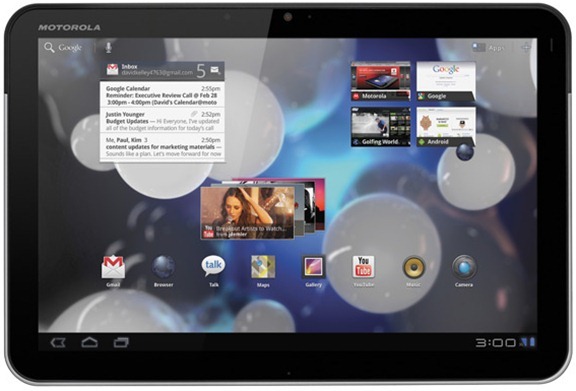 Then, they’ll likely release a newish version of the that same Verizon XOOM, but with a 4G LTE radio already built in. We’re doubting it’ll look all that different or have a bump in specs, so what we all care about is really what’s beyond that. Does Moto have something up their sleeves for the second half of 2011? We’ve seen Sanjay Jha hint at 7″ tablets time and time again, plus there is a chance that Kal-el quad-core tablets could be seen before the end of the year. We’ve even heard the codename “Ghost” mentioned, but are unsure of the reliability of that tip. No matter what though, Motorola needs to come back with something strong or 2011 might end up being the year of disappointments for a company that seemed to be doing all of the right things less than a year and a half ago. With devices still hitting consumers hands with locked bootloaders, they not only have investors to appease, but they also are starting to lose touch with those that actually purchase their products. And enough rambling, go grab that Staples deal before it’s gone! Cheers for the coupon code Max!